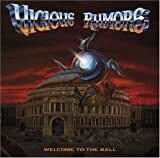 VICIOUS RUMORS DUST TO DUST LYRICS"
It's a long hard road to burn. The hidden fire of liife has come unturned. Lay down your tracks upon the shore. It can take you down anywhere you tread. Trying to make it through another day. You never know when your time lies. You're here and gone, like all the rest. It's dust to dust for you my friend is here! All Vicious Rumors - Dust To Dust lyrics are property and © copyright of their respective owners. All Dust To Dust lyrics provided for educational purposes only.